Left: Ewan McGregor in the prequels. 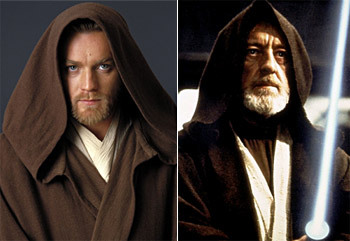 Right: Alec Guinness in the original trilogy. "Before you go, master, answer me this one, last, big question. Do I grow up to become Alec Guinness?" — French and Saunders: "The Phantom Millennium"
When a story spans decades, it is often not possible for the one actor to play the same character throughout. Heavy make-up might just let the 30 year old play 90, but never 10. Instead, multiple actors are used for the same role. A time-shifted actor will usually be credited as playing 'Young Mr X' or 'Old Ms Y'. Differentiated from the other actor replacement tropes by the passage of long stretches of story-internal time. If those long stretches of time have to pass during a short stretch of footage, an Age Cut will allow the actors to be swapped quickly. This is especially popular in prequels and sequels, or in stories with a Framing Device in which 'Old Ms Y' recalls events of her younger days. Sometimes the necessary resemblance between Mr X and Young Mr X will be achieved by use of a Real-Life Relative. If only a photograph is required, an old picture of the actor/actress will suffice. Compare and Contrast Role Reprisal. See also Identical Grandson. Played for laughs in a Visa check card commercial, where Charlie Sheen waits so long for a store's ID verification that he ages into Martin Sheen. Store Clerk: This doesn't look like you. Ranma (from Ranma ½)'s recast in the dub could be seen as this, considering his voice changes from a woman performing a male's voice to a male performing a male's voice, and subsequently sounded much older. Kenichi: The Mightiest Disciple: Originally averted with young Kenichi (with Josh Grelle voicing the character's younger flashbacks), but on a lengthy flashback, Leah Clark filled in instead. For Sailor Moon, most of the Scouts' younger appearances were voiced by their regular voice actors (in both English and Japanese)... except for Darien/Mamoru, who was voiced by a female voice actress in both English and Japanese instead (Megumi Ogata and Julie Lemineax respectively). Ironically, in the Spanish dub, young Darien was voiced by Patricia Acededo, the Spanish voice of Sailor Moon herself. In Slayers, Lina's younger self in the Naga adventures was voiced by Cynthia Martinez instead of Lisa Ortiz. While this recast had little to do with the character's age, as the studio also changed, it's interesting that it worked out this way. Beet the Vandel Buster: Beet's voice changed from Tiffany Grant to Colleen Clinkenbeard after the character grew up. Ironically, both voices were women. Averted with Tenchi Muyo!, as Tenchi's younger flashback appearances also featured Matt Miller as his voice. This is different from the Japanese version, which did cast a female voice actress to handle those scenes. Bleach: Ichigo Kurosaki is usually Johnny Yong Bosch, but not in his younger flashback appearances, where he's instead voiced by Mona Marshall. Happens with the boys from the Super Peace Busters in Ano Hana The Flower We Saw That Day. The younger boys are voiced by women (Mutsumi Tamura, Asami Seto and Aki Toyosaki) and their teenage selves are voiced by men (Miyu Irino, Takahiro Sakurai and Takayuki Kondo, respectively). The girls are played by the same actresses as kids and teenagers. In From the New World, after a time skip of two years, the five main children go from 12 to 14. The boys, Satoru, Mamoru and Shun switch from female actresses to male. Kanako Tojo, Haruka Kudou and Mai Todo voice the 12-year-old versions and Yuuki Kaji, Motoki Takagi, Ayumu Murase voice the 14-year-old versions, respectively. Also the main character Saki Watanabe is voiced by Risa Taneda, although her older self at 36 years old as a narrator is voiced by Aya Endo. In Saint Seiya Omega, whenever Kouga (normally voiced by Hikaru Midorikawa) is shown as a young child, he's voiced by Satsuki Yukino, who also happens to voice Yuna. In both the Japanese and English versions, Simon's voice in the Distant Finale changes from Tetsuya Kakihara/Yuri Lowenthal to Takayuki Sugo/Tony Oliver because he was Narrator All Along. In the English version Rossiu's voice actors in the epilogue changes from Johnny Yong Bosch to Michael McConnohie. Nia's voice actor in the English version changing from Hynden Walch to Bridget Hoffman borders between this and The Other Darrin: they voiced her before and after a seven-year Time Skip, but this was just a conveniently-timed coincidence when the former became unavailable, as evident from every other character keeping the same actor. While the anime adaptation of JoJo's Bizarre Adventure averted this for some characters between Phantom Blood and Battle Tendency, Stardust Crusaders plays this straight with Joseph Joestar, changing from Tomokazu Sugita to Unshou Ishizuka. This happens with Char Aznable / Casval Rem Deikun in Mobile Suit Gundam: The Origin where his kid version is voiced by Mayumi Tanaka while his teenager and adult self is voiced by Shuichi Ikeda. The Latin-American dub of Digimon Adventure 02 recast most of the child actors from Digimon Adventure. Understandable, seeing as three years have passed in-universe. In the English dub for Digimon Adventure 02, TK's voice also changed as well, being the only one of the original 8 Digi-Destined to change their voice. Though like the Latin-American dub, this is understandable. In A Man Like No Other- a crossover with The Hunger Games and The Avengers (2012)- for the purposes of the storyline, Mark Ruffalo and Donald Sutherland portray the past and future versions of Bruce Banner. In Atlantis: The Lost Empire, Kida is voiced by Natalie Strom as a child, but by Cree Summer as an adult. In Balto, Rosy is voiced by Juliette Brewer as child, and played (in a live action sequence) by Miriam Margolyes (Professor Sprout of the Harry Potter films) as an adult. Jason Todd in Batman: Under the Red Hood is played by three different actors for when the character is a child, a teen and an adult. Bolt is an interesting example. Chloë Moretz originally voiced Penny both as a child and as a teenager. However, Disney wanted another big "name" attached to the film to attract a younger audience, so Miley Cyrus was cast... but only as a teenager. Chloe Moretz' dialogue as younger Penny remained in the film. In both movie and musical versions of The Lion King, Simba and Nala are played by one set of actors as cubs and another as adults. Averted in Toy Story 3 where (the now adult) Andy is actually still voiced by the same actor that played him in Toy Story and Toy Story 2. Played straight during the film's prologue, however. In The Book of Life , Manolo, Maria, and Joaquin are voiced by Diego Luna, Zoe Saldana, and Channing Tatum as adults, while their child versions shown at the beginning are voiced by Emil Bastien Bouffard, Genesis Ochoa, and Pierce Grangon. In Super Man Vs The Elite , Robin Atkin Downes and Marcella Lentz Pope voice Manchester Black and Vera Black, while Grey DeLisle and Tara Strong voice them as kids. In the video to "The Miracle", the members of Queen are played by kids. In Moonwalker, the same actor played young Michael Jackson in a sequence that parodies "Bad" and later played him in "The Jacksons: An American Dream." The Spice Girls video for "Mama" has child actors playing the girls intercut with pictures of the real girls as children. The video for Van Halen's "Hot For Teacher" had kids playing younger versions of the band members. In The BBC radio adaptation of The Once and Future King, Paul Ready plays Arthur and Paul Heath plays Sir Kay. Edward Bracy plays Wart and Ethan Hammer plays Young Kay. In ''What Does the K. Stand For?" Stephen K. Amos plays himself as an adult narrator, and Shaquille Ali-Yebuah plays Young Stephen. In Follies, the four middle-aged main characters all have younger doubles, who appear in the very frequent flashbacks. Many secondary characters also have younger doubles who mimic their dance steps. The musical Les Misérables requires a child to play young Cosette (whose face is on the poster) and a young lady to play adult Cosette. Young Eponine has a walk on role just after the "Castle on a Cloud" number, and grown-up Eponine becomes a major character a few songs later. Notably, the two young actresses alternate between these roles. The twenty-plus-year run of the show means there has been at least one case of an actress who played Young Cosette as a child returning to play grown-up Eponine. Similarly, Lea Salonga played Eponine on Broadway in 1993 and then sang the part of Fantine at the Twenty-Fifth Anniversary Concert. In the 2012 film, Isabelle Allen and Natalya Wallace played Young Cosette and Eponine, while Amanda Seyfried and Samantha Barks played their adult counterparts. In the musical Gypsy, two child actresses play Baby June and Baby Louise at the opening of the show, only to grow up (with help from some strobe lights) into the adult actresses who play Dainty June and Louise. Presumably, the boys that Rose kidnaps en route to LA also grow up to be some of the Farmboys, although it's never stated outright which boy is which. In the Andrew Lloyd Webber musical Aspects of Love, two actresses play Jenny at age 12 and age 15. In the Broadway production they were similar-looking sisters, but the original London production had two non-related girls. Mame follows Patrick Dennis, both as a 10 year-old and as a young adult. As such, there are two actors. And they sing a duet at the start of act 2. In Once On This Island, Ti Moune ages from a small child to a young adult in the space of about five seconds as part of a song, requiring the use of this trope. The ballet Fall River Legend casts two dancers as the Accused (Lizzie Borden), one playing her as a teenager and one as an adult. They occasionally dance together, but without the younger Accused acknowledging her older self. Glen Tetley's ballet adaptation of Alice in Wonderland has two dancers as Alice, one as an older woman and one as a child. In most productions of The Nutcracker, Clara is played by one young actress throughout. However, the Mariinsky Ballet's version, in which the character is called 'Masha', will cast a young girl (eleven or twelve) as Masha in the first act, and transition to an older dancer (usually a student in her last few years at the Vaganova Academy) for the second act, known as 'Princess Masha'. This is due to Princess Masha's significantly more complicated dancing in the second act in this particular production. As with other theatre productions, it's not uncommon for the same student to play Masha and then, several years later, play Princess Masha. There are two actors for Philip Hamilton in Hamilton, one at 9 years old in "Take a Break" and another (who also plays John Laurens in Act I) from "The Reynolds Pamphlet" on. In Metal Gear Solid 3: Snake Eater, a prequel to the entire Metal Gear series, young Ocelot is voiced by Josh Keaton instead of Patric Zimmerman, who voices "present day" Ocelot, and in Metal Gear Solid V: The Phantom Pain, which is set between the two, he's voiced by Troy Baker. There's also SIGINT, voiced by James Mathis, who is revealed later in the series to actually be a young Donald Anderson, played by Greg Eagles in Metal Gear Solid. But then that Anderson was a fake anyway. As well, there's Big Boss, who is voiced by David Hayter in Metal Gear Solid 3, Kiefer Sutherland in Metal Gear Solid V, and Richard Doyle in Metal Gear Solid 4: Guns of the Patriots. Kazuhira/McDonnell Miller is another example, having gone from Cam Clarke in MGS1 to Robin Atkin Downes for Metal Gear Solid: Peace Walker and MGSV. It's also similar to the Sigint/Anderson example, in that the Miller of MGS1 isn't the real Miller, but rather Liquid Snake (also voiced by Clarke) impersonating him. The Longest Journey features April Ryan and Young April Ryan. In Final Fantasy X, the adult Tidus was played by James Arnold Taylor, while the young Tidus was voiced by Cree Summer in that game and Shaun Fleming in Kingdom Hearts. Speaking of Cree Summer, in Fallout she voices Tandi as a sixteen year old girl. In Fallout 2, Tandi is now President of the New California Republic and aged 96, with Tress MacNeille taking over her voice. Batman: Arkham Asylum sees Rick D. Wasserman voice a young Jim Gordon during the flashback to the murder of Thomas and Martha Wayne during the second Scarecrow hallucination, rather than Tom Kane, Gordon's voice actor in the present day of the game. The same flashback sees Kimberly Brooks voice the young Bruce Wayne. Unlike Batman: Arkham Asylum and Batman: Arkham City, which saw Kevin Conroy and Mark Hamill reprise the respective roles of Batman and the Joker, Batman: Arkham Origins sees Roger Craig Smith as Batman and Troy Baker as the Joker because Origins takes place at an earlier place. In the English dub for Kingdom Hearts Kairi is voiced by Hayden Panettiere and Alyson Stoner as a teen, whereas she's voiced by Ariel Winter as a kid. In the same series, Haley Joel Osment plays Sora when he's a teenager, even in games where Sora is de-aged to his KHI body, while he's voiced by Luke Manriquez when he's a kid. Riku is also voiced by David Gallagher as a teen, and Ty Panitz as a kid. For Kingdom Hearts III, Drake Bell is voicing Master Eraqus as a teen/young adult, where he's voiced by Mark Hamill as an old man. All versions of Xehanort have different voice actors. Old Xehanort is voiced by Leonard Nimoy, young Xehanort has been voiced by David Gallagher, then Benjamin Diskin, Xemnas is voiced by Paul St. Walker, and Ansem, Seeker of Darkness, has been voiced by Billy Zane, then Richard Epcar. In Atop the Fourth Wall's Superman vs. the Terminator #1 episode, Linkara's self from 2039 was played by his real-life father. Hilarious played straight in this Picnicface video. In the Ben 10 franchise, Tara Strong voiced the titular ten-year-old in the original series. When the character was aged up to fifteen for Alien Force, Yuri Lowenthal took over and continued on in Ultimate Alien. The same applies for the respective actors behind Gwen and Kevin. Meanwhile, Fred Tatasciore has voiced an adult Ben and Tara Strong an adult Gwen. Unlike Ben, though, anytime we see a younger Gwen after the original series she still has the same voice actor as she does as a teenager. This also extends to the adult Gwen. Another example is the Justice League Unlimited episode, "Kids' Stuff". Superman, Batman, Wonder Woman and Green Lantern are magically made into children and voiced by age appropriate actors. Brought home in episodes of Batman Beyond set in the future, which feature a robust 60-something Superman now voiced by Christopher McDonald - the voice of Superman's father Jor-El in all his DCAU appearances. The DC Super Hero Girls episode "Truth Of The Lasso" averts with, with the younger Wonder Woman and Cheetah still being voiced by Grey DeLisle Griffin and Ashley Eckstein. The DuckTales (2017) episode "Last Christmas" has a young Donald voiced by Russi Taylor instead of Tony Anselmo, even though she's ironically older than him. Esteban is voiced by Christian Lanz, but in the episode "Island Of Youth", his teenage self is voiced by Anthony Alvia, while Desmond Gerber voices him as a baby. Princess Marisa is voiced by Gina Rodriguez while her child self in a flashback is voiced by Gia Lopez. Futurama averts this trope with the main crew, who are played by the same actors when we see them as children and as older adults. The trope is played straighter with many of the secondary characters (such as Fry's brother). On Handy Manny , Wilmer Valderrama voices Manny as an adult, while Nika Futterman voices him as a child. Hey Arnold! : Arnold is voiced by Rusty Flood in the flashbacks in "Parents Day" and "Helga on the Couch" instead of his normal voice actors (he was recast many times). Likewise, Helga was voiced by creator Craig Bartlett's daughter Katie instead of Francesca Marie Smith during the same flashback in the latter episode. On Justice League Action, Batman is voiced by Kevin Conroy, Zatanna is voiced by Lacey Chabert, and John Constantine is voiced by Damian O'Hare. However, "Trick or Threat", which featured child versions of them and Doctor Fate (who has no adult voice actor) due to Klarion the Witch Boy turning them into kids, Batman is voiced by Tara Strong, Zatanna by Dayci Brookshire, and John Constantine by Paula Rhodes. On Kick Buttowski: Suburban Daredevil, Kick's grandfather is voiced by Ed O'Neill, while the flashbacks to his daredevil days in the army has him voiced by Kick's voice actor, Charlie Schlatter. In Love, Death & Robots , Elaine Tan voices Yan as an adult while Sumalee Montano voices her younger self, although she's ironically older than the former. In Beforel Orel, the prequel to Moral Orel, Clay's father (and Orel's grandfather) Arthur is voiced by Joe Unger, instead of the show's creator, Dino Stamatopoulos. This was averted with A Pup Named Scooby-Doo, where Don Messick and Casey Kasem reprised their roles of Scooby and Shaggy respectively. Fred, Velma, and Daphne did have real childrennote Steve Carlson, Kellie Martin, and Christina Lange as their voices, though, instead of their respective adult voice actorsnote Frank Welker, Heather North, and Marla Frumkin, with this being the first and only time to date (not counting the live-action films) that Fred was played by someone other than Frank Welker. Recess: All Growed Down averts this trope during the scene when we see the nine-year-old cast as kindergarteners, however, this led to some awkward moments regarding the voices of Mikey and Vince, as their voices already broke (Mikey's during the break between the end of the series and production on the DTV movies, and Vince mid-way through the first season). Played straight somewhat as T.J.'s voice actor was replaced with a much younger kid with a higher voice (making his portrayal of T.J. loathed among the fandom), which worked well for his kindergarten scenes. The season 1 finale of Scooby-Doo! Mystery Incorporated has a flashback that shows younger versions of Ricky Owen (Lewis Black) , Cassidy Williams (Vivica A. Fox) , Brad Chiles (Tim Matheson), and Judy Reeves (Tia Carrere) , respectively voiced by Scott Menville, Kimberly Brooks, Nolan North, and Kari Wahlgren. Zeta and Samira on Shimmer and Shine are voiced by Lacey Chabert and Nikki Soo Hoo while their younger selves are voiced by Ryan Bartley and Brennley Brown in the episode "Samira And Zeta" . Averted in The Simpsons, in which the actors will voice their characters' young selves in flashbacks and the children's voice actors voice the character's adult selves in future episodes. On Sofia the First , the episode "Through The Looking Back Glass" has child versions of Cedric (Jess Harnell) and his sister Cordelia (Rachael MacFarlane) voiced by Emil Bastien Bouffard and Anna Graves. Star vs. the Forces of Evil: Queen Moon is voiced by Grey DeLisle, but a flashback in "Moon the Undaunted" has her teenage self being voiced by Katie Driver. Likewise, Meteora Butterfly is voiced by Jessica Walter as an adult and Tress MacNeille as a child. In Star Wars: The Clone Wars and the holocron recording of him in the first episode of Star Wars Rebels, Obi-Wan Kenobi is voiced by James Arnold Taylor. When he turns up in person in the third season of Rebels, he's voiced by Stephen Stanton, who it turns out does a mean Alec Guinness impression. In Stretch Armstrong and the Flex Fighters , Riya is normally voiced by Nazneen Contractor, but her younger self in the episode "Riya's Revenge" is voiced by Kathreen Khavari. In Sym-Bionic Titan, we see a younger Lance in two episodes, both voiced by child actors instead of Kevin Thoms. Although in "Shaman of Fear", he is voiced by Elan Garfias and in "Shadows of Youth" he is voiced by John DeVito, despiting his younger self appearing to be roughly the same age both times. Much like the film it's based on, this series sees Rapunzel voiced by Mandy Moore as an adult, and Ivy George as a child, much like Delanie Rose Stein. Cassandra and Lance are voiced by Eden Espinosa and James Monroe Iglehart, but their younger selves in "You're Kidding Me" are voiced by Cassie Glow and Blake Moore. In ThunderCats (2011), the younger Lion-O is played in one episode (as well as in a short where he's a baby) by Tara Strong. Interestingly, Cheetara's younger self is voiced in flashback by Grey DeLisle, who frequently works with the former. One episode of Transformers: Rescue Bots has Elan Garfias' character Cody turned into an adult, who's voiced by Oliver Vaquer.